With arms relaxed at your sides, measure around your chest at the armpits, over the highest part of your chest and shoulder blades, keeping the tape parallel to the floor. Measure around natural waistline below last rib and above hip bones. Don’t hold your breath. Extend your arm straight out to the side. 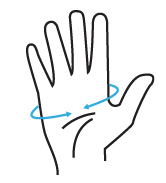 Measure from the center of the back to the wrist. For best comfort, round up to find total inches. Measure from base of inner leg seam to top of shoe. call us at 800-645-3744 or email Customer Service. For the sleeve measurement, make sure you measure across the back.